hen Katie Taylor sits in the dressing room to gather her thoughts on Saturday evening, the spirit of Jackie Tonawanda won’t be too far away. They’re both part of the vital chorus that has given women’s boxing its voice. It’s a moment, this, for the Bray fighter. Taylor is nothing if not a clear-headed antidote to the exaggerated pronouncements and promises that are part of the boxing tradition through the centuries. But even Taylor couldn’t resist acknowledging this week that after everything – after a childhood and adolescence devoted to becoming a boxer without ever knowing if she’d be able to fight; the long wait for Olympic status; the slow build up and golden sheen of the London games in 2012; the lost look frozen on her face as she left the ring beaten and out of the Rio Olympics four years later and the new uncertainty of facing into a professional career at the age of 30 – this night feels like a moment worth pausing for. Her first fight in Madison Square Garden. Taylor won’t be the only draw in the city. Saturday night’s the finale of Bruce Springteen’s long-running Broadway show and Ethan Hawke is starring in the late Sam Shepherd’s True West nearby and as ever, the city will pull its souls in a million different directions. But still, for any boxer, those few minutes before you make your debut at the Garden, with its perpetual echoes of Ali-Frazier and the tradition of the Marciano and Joe Louis fights in the older, demolished versions of the place, can come just once in a life time. Breathe the stale glorious air. Katie Taylor was born in 1986. A full 11 years before that event, a Long Island woman named Jackie Garrett (b. 1933) had her hands full fighting the New York State Athletic Commission for her right to box in the state. Her applications for a licence were repeatedly and derisively dismissed. She fought as Jackie Tonawanda and was forced to travel outside the state on the rare occasions she did get to fight. Jackie Tonawanda was a trailblazer in the 1970s, taking a case against the state of New York for the right to box. Photograph: Monte Fresco/Mirrorpix/Getty Images. Tonawanda sued the state for discrimination, she took her case to the Human Rights commission arguing that she was being denied her right to make a living and finally she took her case to the state Supreme Court – which found in her favour. She also agreed to take part in an event called the Aaron Banks Oriental World of Self Defence Show, which featured mixed martial arts fighters and was outside the realm of the New York athletic commission. It took place in Madison Square Garden in the summer of 1975. She met a martial arts exponent named Larry Rodenia, who entered the ring head-banded and expectant of victory. There’s a brilliant if grainy photograph out there of Tonawanda catching him with the hooking right that floored him, white-tee shirted and swivelling her hips as she throws her weight behind the punch and catching her man beautifully. He never saw the punch coming. It didn’t matter that the bout wasn’t officially sanctioned: Tonawanda was the first woman to ever lace up a pair of gloves in Madison Square Garden. The moment confirmed what many in the men’s boxing had privately suspected: there was nothing to be gained from fighting a woman. In 1978, three female fighters – Cathy ‘Cat’ Davis, Marian Trimiar and Tonawanda – were granted licences by the New York commission and Davis featured on the cover of The Ring magazine under the headline ‘Is women’s boxing here to stay?’ It was, but for the generation that succeeded Jackie Tonawanda. She is recorded as having fought only one professional bout and a car accident in 1986 ended her fighting career. 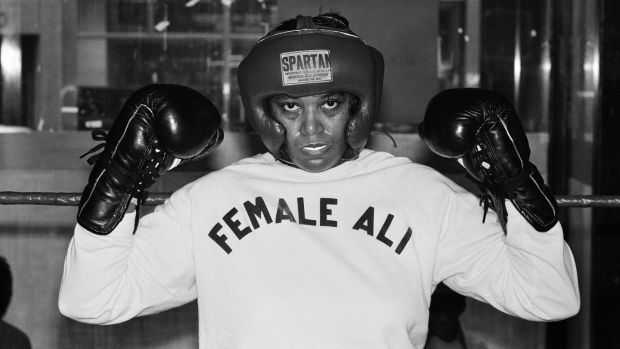 The chauvinistic, blinkered opinion running through boxing didn’t extend to its capriciousness: Tonawanda was marginalised in reference and boxers like Christy Martin and Laila Ali made careers and pushed the cause of women’s boxing. Every one of Katie Taylor’s years as a sportswoman has been about advancing the same cause. It’s still going on. In interviews around the release of the documentary Katie, she spoke in balanced terms about the conclusion of her fighting life. She is 32 years old now, just two years into her pro career but a veteran of the fight game. Next year’s schedule of planned high-profile fights is dazzling with promise for Taylor. It’s a stark recovery from the hollow day in Rio when her boxing world crashed about her with that defeat to Mira Potkonen. It was a bleak stadium, Rio, on the periphery of the Olympic park. And the striking thing about that day was that nothing stopped. In a matter of minutes, Taylor was gone from the ring and had done her television interviews and found herself standing, then, in this nothing, tented area just yards from where two volunteers stood in the shade, bored beyond belief. That’s how you lose your Olympic title and your general bearing. The question we were left with that day was where Taylor would go from that moment. Professional boxing is still male-oriented and murky at the best of times. It offered to Taylor only the certainty of an uphill struggle and one without the familiarity and closeness she had enjoyed when her father was her coach. At one stage in the Katie documentary, Taylor is filmed looking at the horde of medals she had won as an amateur but she has eyes only for the one that isn’t there: the gold in Rio. The years since then have taken her to Connecticut to a radically different life and surroundings as she set about re-calibrating herself in the unforgiving world of professionalism. There’s no doubt that Katie-mania has subsided in Ireland since the explosion of joy and national pride she generated in 2012. Her 11 professional fights have taken place in venues across England and America. News of her various wins has been taken for granted because Ireland has always taken it for granted that Katie would win. The release of Ross Whitaker’s documentary film has been timely in that it helps to remind the Irish public of just how long Taylor has been excelling at her game – and that those standards haven’t dropped. Her status in Ireland is such that she renders the gender divide redundant: Taylor is simply one of the most important athletes the country has produced. She is heavily favoured to beat Eva Wahlstrom, her sparring partner from their amateur days, when they meet in Manhattan on the undercard of the Canelo Alvarez-Rocky Fielding middleweight bout. It’s likely to be a better fight than the main bill. But it’s the few minutes before she steps out into the famous arena that will be Taylor’s alone, to remember when all of this is done. Ali’s revered words, about the fight being “won or lost far away from witnesses, behind the lines, in the gym, and out there on the road, long before I dance under those lights” are inspirational to hear or to read. But to live by that credo is an inestimably tougher path.